Today Google announced a timeline for the shutdown of consumer Google+ and the removal of Google+ features from Blogger. While Google+ itself won't be entirely shut down for consumer users until April 2nd, Google+ features on Blogger will be removed beginning February 4th, less than a week from now. This includes Google+ Comments, badges and widgets and Google+ Profiles. Note that these changes only affect Google+ features. If you are using a Blogger profile and Blogger comments, and you don't have any Google+ badges and widgets in your blog's layout, you probably won't notice any difference. Watch the video for an overview, or read on for more details. As of February 4th, the Google+ Followers, Google+ +1 and Google+ Badge gadgets will no longer be available to be added to a blog's Layout. All instances of these widgets will be removed from all Blogger blogs. Google+ +1 and share buttons below posts or on the top navigation bar will also be removed. If you manually added a Google+ Follower badge, Google+ Community badge, +1 button or embedded Google+ posts, these will stop serving on March 7th when the Google+ API is shut down. You will have to remove this code from your blog's layout or posts yourself. On February 4th, blogs using Google+ Comments will be reverted to Blogger Comments. 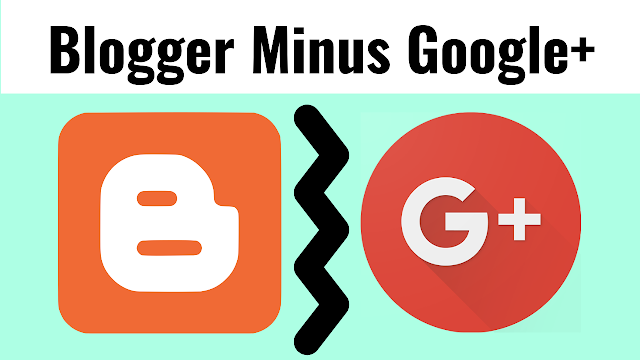 Unfortunately the Google+ Comments cannot be converted to Blogger comments and will disappear. 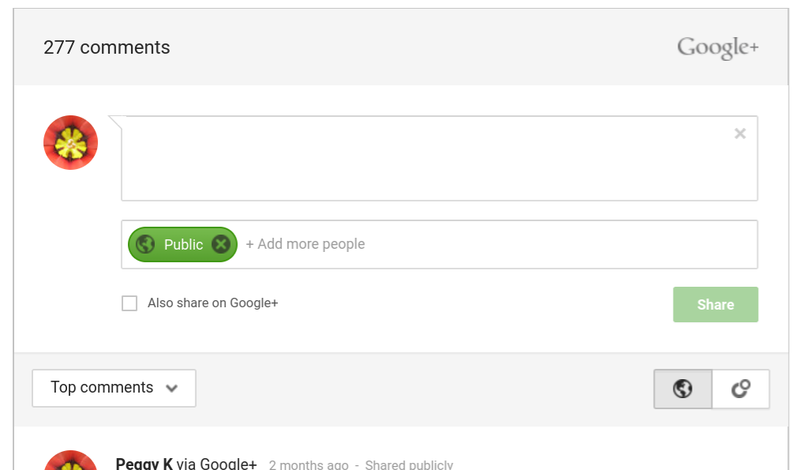 The Google+ comments you have posted should be included in the Google+ Stream archive you can download using Google Takeout. Google+ Comments posted by other users cannot be directly backed up. You can save some comments: Any Google+ blog comments (by anyone) that you +1 and any comments that you post will be in your Google+ Activity Log (plus.google.com/apps/activities). You can download a copy by creating an archive of your Google+ Stream in Google Takeout. While Google+ Comments would almost all disappear when consumer Google+ shuts down April 2nd anyway, I'm surprised at how soon Blogger is removing them. That doesn't give you much time to take a last look at the discussions on your blog. The good news is that Blogger Comments have more moderation options than Google+ Comments, so that should mean less visible spam. Starting in March 2019, Blogger will return to only using Blogger profiles. If you use a Google+ Profile for your Blogger account, the first time you sign in to Blogger after the change you will be prompted to provide a display name and avatar for your profile. Until you do that, you will appear as an "unknown author". Your Blogger profile name and photo do not need to be the same as your Google account name and photo. Go wild. 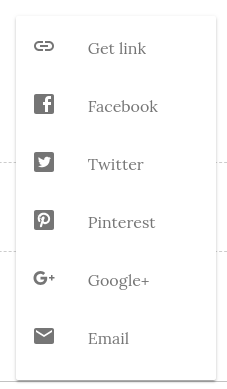 You can switch from your Google+ Profile to a Blogger profile now in your blog's Settings > User Settings. On your Blogger account's Posts page, there is a Share link under each post. 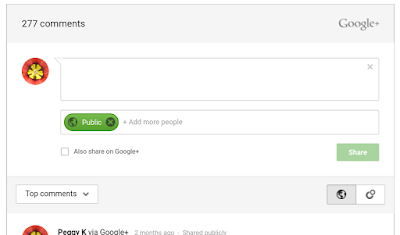 Clicking "Share" shares the post to Google+ (to some users' confusion, as they expect it will provide multiple sharing options). It's not mentioned in Blogger's announcement, but I expect that will be removed as well. December 2011: All Blogger users can use a Google+ Profile. When a post is published, there is the option to be automatically prompted to post to Google+. The "Share" link is added to the Blogger account posts page. 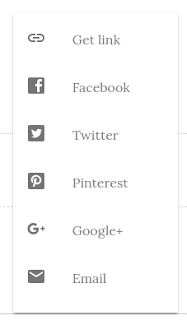 July 2012: Google+ settings tab added to the Blogger dashboard. Connect your blog to a Google+ Page. November 2012: Google+ Followers gadget added. December 2012: Plus mention people in your posts. Mentioned people are linked when the Blogger post is shared to Google+. May 2016: Separate Google+ settings tab removed, Google+ comments and sharing settings moved to the Blogger Posts, Comments, Sharing settings. July 2017: Google+ +1 button simplified so that it no longer tracks the number of +1s. The +1 count for posts removed from the Blogger dashboard. So people will lose SIX YEARS of comments. That is shattering. You can download an archive of your Google+ Activity Log in Google Takeout (it's part of your Google+ Stream). I was hoping that Google would at least have the DECENCY to offer a way of migrating our G+ comments to Blogger, especially that a few years ago they were pushing us to use G+. When I signed up for Blogger in 2014, full Blogger profiles were not even available, it had to be G+, so using G+ comments made sense. I'm going to lose 4.5 years worth of comments on my blog now. Had I known back then that this was even a remote possibility, I would have never chosen G+. Zsuzsa: I hear you. There are some folks with programming skills working to create tools that can download an archive of the Google+ comments, which should be available even if not visible on your blog until the Google+ API shuts down on March 7th. When they have something to share, I'll post about it here. Zsuzsa: there is a script you can use to download a copy of all the Google+ Comments from your blog. This should work until the Google+ API shuts down on March 7th. Learn more from Filip Slagter on Google+ and get the script here: github.com/FiXato/Plexodus-Tools/blob/master/README.md#google-comments-on-blogger-blogs-exporter. It doesn't have a user-friendly UI, and it's apparently only been tested on a Mac, but it should work. So up to now Blogger blogs could be configured in either of two ways: (1) Blogger comments mode, or (2) Google+ comments mode. And I understand that comments made on this last type of Blogger blogs —ie, ‘(2) Google+ comments mode’— will be deleted. But I noticed that people with Google+ profiles have also left comments on the first type of Blogger blogs —(1) Blogger comments mode—, along with comments left by people with Blogger profiles. My question is: will the comments left by people with Google+ profiles on ‘(1) Blogger comments mode’ blogs also be deleted? The answer is no, Blogger comments left by people using their Google account identity will not be removed whether they had a Google+ Profile or not. In preparation for the Google+ profiles disappearing, yesterday I disconnected by blog from my Google+ profile. I would not recommend anyone else do this yet: every single one of my comments, across 131 posts, just disappeared!! Your comments would have disappeared anyway. Google changed all G+ profiles back to Blogger. I've lost ALL my comments too going back to 2014. This is not what happened. Following the deadline on Feb 4th, the "Google+ Comments" option was reverted to "Blogger Comments" (nothing to do with "Google+ profiles"). On Feb 5th, I still seemed to have most of my comments available. It wasn't until I disconnected the blog from my Google+ profile that every single comment disappeared. This was a surprise to me, and not what Google have been saying. I reverted back to a Blogger profile on 1st or 2nd February - I still had my G+ comments up until 6th February, which is when they disappeared over night without me changing to Blogger comments. It happened automatically. I think it's just a coincidence that your comments disappeared just when you changed your profile. Does anybody know if blogs configured as “Blogger comments” will lose any comments left by people with Google+ profiles? I've checked this and noticed that my previous comments left on people's blogs with Blogger comments are still there! I think the only way this is possible is that they were actually through Google and not Google+, but I may be wrong. I remember a few years back Google forced old Blogger accounts to connect to Google, maybe that's why they did it. As Zsuzsa has pointed out, Blogger comments are not affected by the removal of Google+ features. The Blogger commenting system lets people post with their Google account identity, which is there whether the user has a Google+ profile or not. I made an interesting observation today: I've already reported (above) that all the comments on my blog disappeared this month, and the consensus is that they must all have been Google+ ones. Hence, apart from my very latest post, all others now show zero comments .... except, when I look at the 'Stats' for my blog. Every post that is listed during the selected time period shows the old number of comments. Does that mean they still exist somewhere, even though I have no way of finding them? So Google+ comments still "exist" out in the ether until the Google+ API shuts down on March 7th. The change Blogger made was to switch blogs to regular Blogger comments, which stops Google+ comments from displaying on your blog. If your blog was using Google+ comments, then that is probably why you still see those comment numbers.